Jared Faber was professional, efficient and polite. He took care to leave our kitchen as he found it; clean and neat. He appeared to really enjoy his work and was very upbeat. Jared quickly resolved our issue with our dishwasher. Definitely an asset to your company. Really like how you keep the customer informed as to arrival time and your tracking ability. Dave was a great guy and fixed our problem. Excellent experience! When i call Twin City Appliance, I know they are being honest with me and through in what they do. I appreciate the years of knowledge we seem to get from the Techs they use! Thanks Dave! 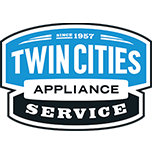 I have used other repair companies, but Twin Citiy Appliance always comes through on top. Dave was our service provider this time, and he was knowledgable, timely, tidy, friendly and through! He knows his stuff. Jared came in appraised the situation, told me that it was frozen, may need a part. Began working on fridge. cleaned up after. When leaving he menstioned that he had the part in the truck. So it was completely repaired in one visit. Great Job. Very professional. REFRIGERATOR KITCHEN-AID KBLC36FMS01 "Checked compressor, tubing and upper panels. All in place and normal. Checked ice maker, damper and fans. Have normal sounds. Pulled fzr basket and EVAP cover. Checked EVAP tubing EVAP fan and panels. All normal. Checked cabinet and adjusted feet. Checked tubing for ice maker. All normal. Could not duplicate sound for cust. Advised cust." REFRIGERATOR WHIRLPOOL WRS555SIHZ00 Installed door. REFRIGERATOR KITCHENAID KRFC300ESS01 "Replaced the filter head assembly and the water valve. It tests good with no leaks T any connection toon after the water hD been on for 15-20 minutes Nd 60 ounces of water were disposed. Also tested with no,leaks at the icemaker connection to the water valve after it filled." DISHWASHER KITCHEN AID KUDC10FXSS5 "Ms pic and of the burnt control board and wires.The power supply wires burnt at the plug in to the board. This damaged the wires to the door latch and switch, along with the wires and p,up in for the touch control panel.To repair the dishwasher we would need the following: Electronic control board W11035586 =$187.19Control panel WPW10481130 = $159.61Wiring harness W10871222 = $102.60OPTIONAL FOR THE CUSTOMER IS THE INSULATION PAD IN THE DOORWPW10073520 =$32.82Sales tax =$32.87Shipping =$12.00Labor=$106.65TOTAL TO REPAIR = $600.92. Auto er is to call the office if they want it repaired instead of replacing the unit." DISHWASHER WHIRLPOOL WDF520PADM7 "Ms pic.The door does close but it does not start because the installer plugged it into the switched outlet.Customer claims the installer informed Ethel that her unit could,leak, so,they put a water sensor under the unit..p,urged it into the correct outlet, removed the kick plate and tested it.The dishwasher tests good with no leaks at the end of a self test cycle. Took a picture of the water sensor left by the installer." WASHER MAYTAG MVWB765FW0 "Washer ....checked washer operation ...checked and found blanket stuck under AGATATOR ....removed AGATATOR from washer and removed blanket fron around transmission shaft ,,put back together,,and recalibrated washer operation .all working good now ,"
REFRIGERATOR WHIRLPOOL WRT318FZDW05 Sr#7724398845. Called techline. Went over svc history. Adjusted foam around ff thermistor per techline. Advised cust if issue happens again to contact cust svc. Per techline will send to eng for review of does not solve issue. RANGE WHIRLPOOL WFE540H0ES1 Found shorted element. Replaced element. Tested burner. DRYER WHIRLPOOL WGD9400SB0 "Dryer ,,,checked dryer operation ....ran dryer and dryer is noisey and squeaking when turning ,,found idler pulley for belt is bad and worn ..replaced idler pulley 270640 from truck stock ..ran and tested all heating and running good now ,; used 1 279640 (IDLER PULLEY) from stock"
REFRIGERATOR KITCHENAID KRFC300ESS01 "Replaced the water valve and tested. There was a small amount of water at the JG fitting. Tech pushed the filter head water line in again and tested the unit. After 4 glasses of water and an icemaker fill it was still dry. Observed it for 15 more minutes before pushing the unit back in and there were drop,eta of water T the JG fitting on the valve again.Am ordering the valve as an RP valve aNd adding the filter housing assembly.Left the water off behind the unit.Office will order and follow up with the customer. ; ordrng 1 WPW10420083 (RP WATER VALVE)"
REFRIGERATOR WHIRLPOOL WRS321SDHZ01 Installed control . Unit running and cooling. REFRIGERATOR KITCHENAID KRMF706ESS01 "Found deli UI shorted and pocket filled with water, found harness broken. Disconnected UI. Dried out pocket. Ordering drawer front ASSM. Advised cust. Please follow up with cust when part avail. ; ordrng 1 W10815669 (dor-fip ss)"
REFRIGERATOR WHIRLPOOL WRT318FZDW05 Installed control. Checked data logger. Found average temps range 28-32 deg. Advised cust. WASHER WHIRLPOOL WTW4855HW1 "Washer ,,,checked washer operation ...checked washer over and checked for vibration ,and noise ,,,checked washer basket and suspension ,,,,adjusted suspension springs ,,,ran cycle with clothes ,,,washer in spin cycle .adjusted front leveling legs and releveled washer ,,,washer is better in spin good all quiet and normall vibration ,, on wood floor also might cause some bounce,"
DOUBLE OVEN WHIRLPOOL WOD51EC0AS04 Checked control for error codes. Found f1e1 mcr failure. Pulled unit from wall. Unit too close to floor to use oven cart. Laid blankets and board on floor to slide oven out onto. Replaced mcr board with one sent for job. Reassembled and reinstalled unit. Tested ovens. RANGE WHIRLPOOL WFE550S0HZ1 First par5 sent glass was shattered. Installed door panel. STACKPAIR WHIRLPOOL WET4027HW0 "Washer checked washer operation,,,,ran cycle washer fills and drains water fine ,no agatation or spin ,motor not running ,,checked under washer and found wire harness to motor is off ,,loose not connected ,,connected wire harness on motor and tightened ,,,ran and tested and all working good running good now recalibrated and reared ,"
WASHER WHIRLPOOL WTW5000DW1 "Washer , Checked washer operation....washer full of water ,clothes in washer blanket and pillows ,,checked and ran test cycle ,,no error codes found .....canceled cycle and water drained out fine ,ran through test cycle and all working good in test ,drawing and spinning good ,washer overloaded and unbalanced ,,causing washer to stop ..recalibrated ,,control .and ran thru .all working good now"
REFRIGERATOR WHIRLPOOL WRT318FZDW05 "Found unit Still freezing in ff. Checked air flow, checked harness and thermistors, checked comp and EVAP. Replaced thermistors, adjusted air flow through damper. ; used 1 W10838965 (THERMISTOR), and 1 WPW10384183 (THERMISTOR) from stock"
REFRIGERATOR WHIRLPOOL WRF757SDHZ00 Installed door. DISHWASHER MAYTAG MDB8959SFZ4 "Found upper rack tracks broken. Replaced tracks. ; used 1 W11259785 (TRACK), and 1 W11259786 (TRACK) from stock"
RANGE WHIRLPOOL WFE525S0HS1 "Ran oven to temp and cycled. Found average temp. 358 deg. Calibrated -10 deg. Checked broiler ok. Advised cust on mach8ne usage, checked control for error codes. None found. Unit working normally." OVEN KITCHENAID KODE300ESS02 Ms pic.Replaced the innderdoor glass and the glass pack on the top oven door. Tests good today and it heating. Advised them to perform a self clean cycle again within 30 days.